I’m one click away from access to one of the most elite areas of the investing world: 893(C) Accounts. I want complete access to these hot retirement income plays! EXTRA INCOME than regular dividend stocks, mutual funds, and ETFs. Other current plays can payout over 10X more income than 11,400 funds being peddled by brokers and advisors. I understand buying these shares could be my BEST chance to a stress-free retirement and to capitalize on this wild bull market. 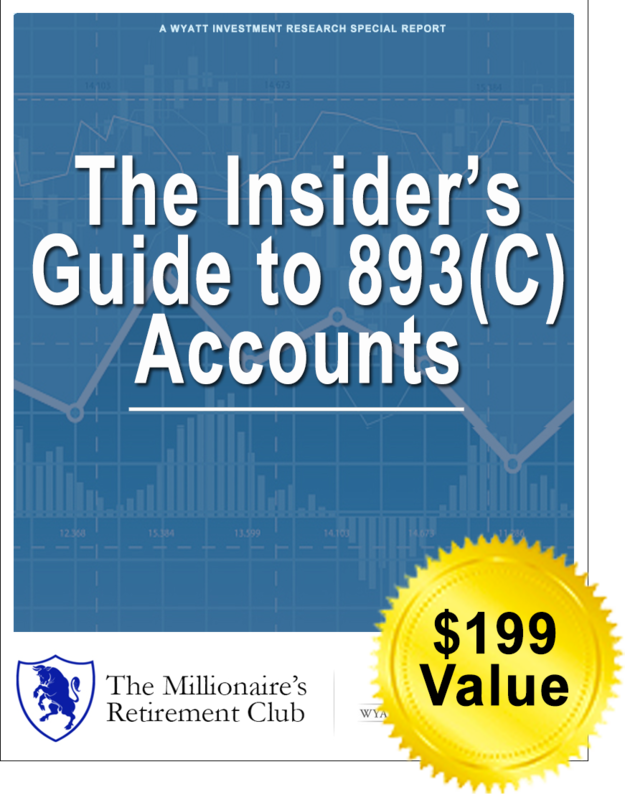 Only 2.7% of Americans invest in this 893(C) accounts and I don’t want to be left out. I’m ready to capture this income today in my 401(k) and IRA! The quiet, “secret” corner of the market paying out millions each month including 6-figures to Bill Gates and average Americans. Five red-hot retirement income plays. Steve dug through 585 investments and select the top 5 to BUY RIGHT NOW. 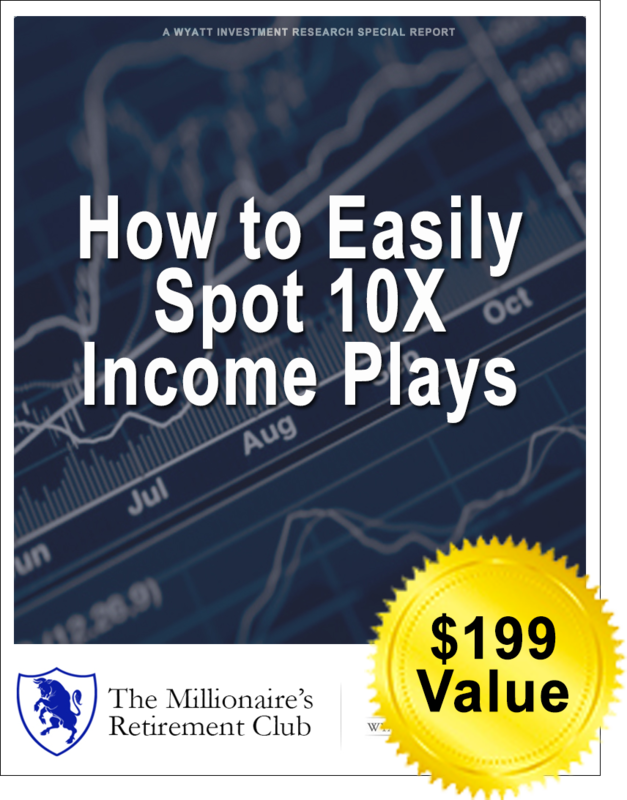 A no-holds barred look at Steve’s “Alpha Scores” and how to use his ‘magic formula' to find the best income plays for earning 2x, 5x, and even 10x more income! Plus, I'll get instant access to the charter issue revealing the top 5 plays. This research gives me COMPLETE details on ground floor retirement income plays. I'm Ready to Make 10x More Retirement Income! On the next page, I’ll get confirmation of access to “arguably the best investment vehicles on the planet,” according to Bloomberg. 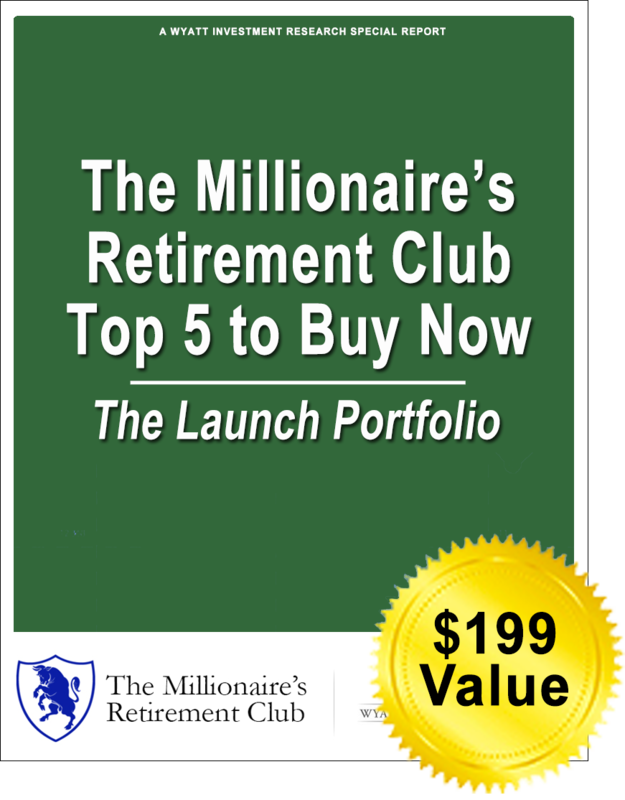 I get access to them --- 100% free --- when I accept my invitation to become a charter member of the Millionaire’s Retirement Club. I’m ready to take this major step in my retirement journey. But, I understand over 317,559 people could see this special offer tomorrow. Only 50 charter members will be accepted, and I want to be one of them! 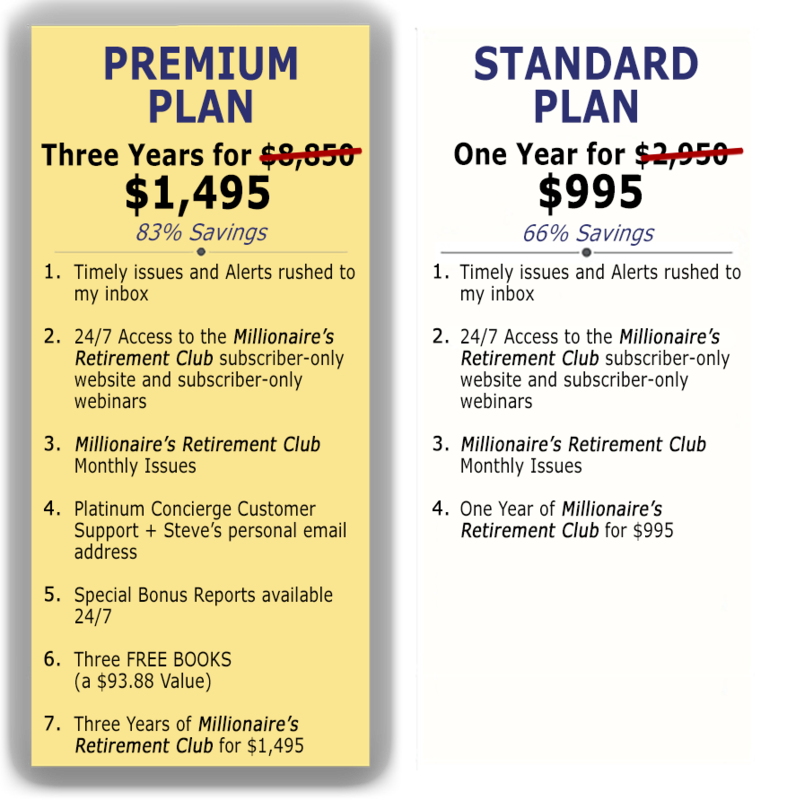 The Millionaire’s Retirement Club is a brand-new service from Steve Mauzy, CFA. Only a limited number of spots can be nominated for ‘charter member’ status. These 50 charter members will be guaranteed: The lowest price forever compared to future members (who could pay up to 3X more). When I join, I’ll get immediate access to all the bonuses, special reports and the portfolio to the Millionaire’s Retirement Club. Given the urgent nature of this research, space MUST be limited. I understand I will never see this ‘Early Bird’ pricing again as the Club grows. If at any time I am not satisfied, I can cancel in the next 30 days and get a no-questions-asked refund. I can still keep the 2 special reports and the inaugural issue with the hottest retirement income picks. If I choose to stay with Steve, my membership will simply be auto-renewed at the best available price so I'll never miss a new income play. I understand it’s VERY likely the 50 spots will be SOLD OUT in the next few minutes. If that’s the case, I will need to wait until this service re-opens and I understand the price will be at least $500 higher. When I enroll as a PREMIUM charter member, Steve will mail me the top three books from his personal library. 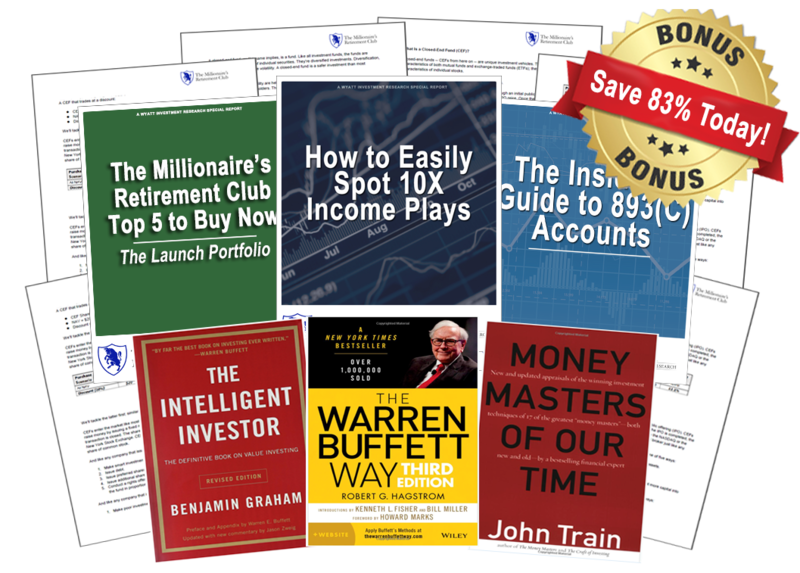 These books guide Steve's income strategies - and they are mine 100% FREE. As a three-year charter member of this Club, these books will be shipped to my door right away as a "thank you" for signing up. GIVE ME ACCESS RIGHT NOW! Get 2 Years for $5,900! Get 1 Year for $2,950! We want you to be 100% satisfied. It’s important to make sure that you understand that this is backed by our unique guarantee. If you decide that I’m wrong, simply cancel at any time during the first 30 days. That gives you time to review my exclusive income alert service. If it isn’t, no hard feelings. Just call my office and receive a 100% refund.